Next time you're stuck for someone to play Pictionary with, don't despair. Now you can always get a game against a computer and, reassuringly, you'll probably win. 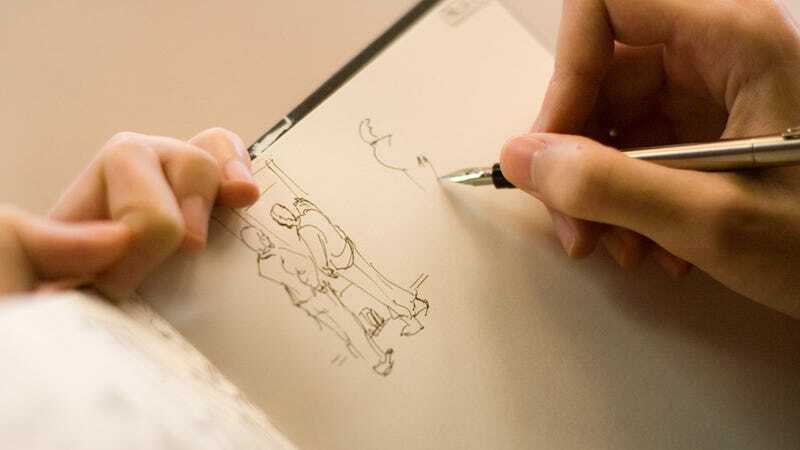 Sketching is something nearly any human can do, even if we use inaccurate representations like outsized ears on rabbits, or stick figures to simplify complex objects. What's remarkable is that most of us can recognise these dodgy sketches, despite their divergence from reality. Pictionary is based on these very abilities. Now machines can play too, after researchers from the Berlin Institute of Technology in Germany and Brown University in Providence, Rhode Island, trained a computer to recognise human sketches. Instead of trying to teach the computer a set of fundamental lines and shapes, they trained it using machine learning on drawings crowdsourced over the internet, with the computer making a best guess at what category a sketch should go in, based on the layout of its lines. Humans easily outplayed the trained computer on a database of 20,000 sketches from 250 different categories, placing 73 per cent of all sketches correctly. The computer could place only 56 per cent of the sketches correctly: much worse than humans, but much better than random chance, which would place sketches correctly only 0.4 per cent of the time. The researchers' iPhone app, tested out in the New Scientist office, works about as well as our limited touchscreen drawing skills allowed. Attempted race cars were correctly and gratifyingly identified as race cars, but also as potential rabbits and or blimps. Other miscues saw the system recognising snowman sketches as toilets, teddy bears as helicopters and human skeletons as pineapples. All the sketches were crowdsourced using Amazon's Mechanical Turk - an online labour market where humans can perform simple tasks for small amounts of money per turn. This meant that the researchers could gather data on how humans tend to sketch objects. The paper noted that the sketches usually started with longer lines, with stroke length decreasing over time. The outline of a tomato, for instance, tended to be drawn first, and most skechers drew the line anti-clockwise. The paper was presented at the recent SIGGRAPH conference in Los Angeles.